NEW ORLEANS – The U.S. Track & Field and Cross Country Coaches Association (USTFCCCA) is pleased to announce FloTrack as the exclusive streaming partner for the 2016 presentation of The Bowerman Award. 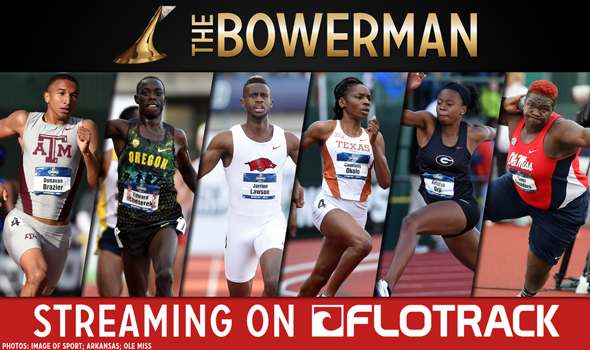 Collegiate track & field’s most outstanding male athlete and female athlete from the 2016 season will be awarded The Bowerman in a 7pm ET ceremony on December 16 live streamed here: http://bit.ly/2dWRhwP on FloTrack free of charge. “We are excited to partner with FloTrack to raise the profile of this momentous award – whose former winners include five medalists from the 2016 Rio Olympics – in the track & field community,” USTFCCCA CEO Sam Seemes said. FloTrack has long been involved in the presentation of The Bowerman in various aspects. The site has carried simulcasts of the ceremony since the award’s inception in 2009, with some of its well-known personalities having played key roles in the award show itself. Ryan Fenton, track & field commentator and general manager of FloTrack, has both hosted the show and served as the sideline reporter in previous years. "The Bowerman is a special award that not only highlights the top athletes in the NCAA, but honors some of the best track & field athletes in the world," Fenton said. "Since its inception, the award been a source of inspiration to high school and college athletes aspiring to become the next great stars of our sport. We are excited to provide even greater exposure to the event by bringing this year’s presentation to the largest high school and college track & field audiences in the country." This year’s award show will whittle down three female finalists and three male finalists to one Bowerman winner per gender. In contention for the women’s award are Courtney Okolo of Texas, Keturah Orji of Georgia and Raven Saunders of Mississippi. Okolo broke the outdoor collegiate record at 400 meters and won NCAA titles both indoors and out in the 400 and the 4×400 relay. Orji broke the American and collegiate records in the outdoor triple jump, and won NCAA titles in the event both indoors and out. Saunders broke the indoor and outdoor collegiate shot put records and won the NCAA Outdoor title in the event. The men’s award will come down to Texas A&M’s Donavan Brazier, three-time finalist Edward Cheserek of Oregon, and Jarrion Lawson of Arkansas. Brazier broke a 50-year old collegiate record in the 800 meters at the NCAA Outdoor Championships, surpassing the old record by nearly a full second. Cheserek amassed five NCAA distance titles on the track in 2016. He won the 3000 and 5000 and anchored the winning distance medley relay indoors, and swept the 5000 and 10,000 outdoors. Lawson won a historic combination of NCAA Outdoor titles in the 100, 200 and long jump – a feat that hadn’t been accomplished since Jesse Owens in the 1930s. He also claimed the NCAA indoor long jump title. Four of this year’s finalists proved their mettle against the best in the world at the 2016 Rio Olympics. Okolo won a gold medal at the 2016 Olympics as a member of Team USA’s 4×400 relay, while Orji was fourth in the Olympic triple jump final with a new American Record, and Saunders was fifth in the Olympic shot put final. For the men, Lawson was fourth in the long jump final. While they were making their marks at the Olympic Games in Rio, former winners were building on their growing legacies as the best in the world. Ashton Eaton, the 2010 men’s winner of The Bowerman, captured his second career gold medal in the decathlon. His was one of three golds won by former Bowerman winners, as both genders’ 2013 Bowerman winners – Derek Drouin and Brianna Rollins – captured Olympic titles in their respective high jump and 100-meter hurdles events. The inaugural class of 2009 also went two-for-two, as Galen Rupp claimed bronze in the marathon and Jenny Simpson won bronze in the 1500 meters. FloSports is a direct-to-consumer, subscription-based sports media company based in Austin, Texas, that partners with event rights holders and governing bodies to unlock a world of sports coverage that true fans have been waiting for. Through live streaming of premier events, original video programming, and weekly studio shows, FloSports is growing the sports, the athletes and the fans. Current verticals under the FloSports header are Wrestling, Grappling, MMA, Elite Fitness, Boxing, Softball, Gymnastics, Marching, Basketball, Volleyball, eSports, Cheerleading, and Track. The U.S. Track & Field and Cross Country Coaches Association (USTFCCCA) is a non-profit professional organization representing cross country and track & field coaches of all levels. The organization represents over 10,000 coaching members encompassing 97% of all NCAA track & field programs (DI, DII, and DIII) and includes members representing the NAIA and NJCAA, as well as a number of state high school coaches associations. The USTFCCCA serves as an advocate for cross country and track & field coaches, providing a leadership structure to assist the needs of a diverse membership, serving as a lobbyist for coaches’ interests, and working as a liaison between the various stakeholders in the sports of cross country and track & field.